Tan lines of spring – Craft-a-licious . .
Mullewa is renown for its wildflower displays, and is just 100km shy of the coast. However we only just made it here as Handy Husband, the driver, was suffering from back pain that seemed to be increasing with every kilometer driven. Once we found the caravan park HH immediately had to lie down on the bed. Where he has been for the last 5 days. Wonderful Wife, who doesn’t drive – ever, walked back into township to locate medical facilities. She then returned to unhook the caravan – hitches, hoses, tow bar etc., assisted pained HH into car before DRIVING car to hospital. It’s true there may have been a bit of kangaroo fuel in the tank, HH groaning with each lurch of the vehicle, but we made it in one piece. Thank heavens his back’s now improving. But, enough of my own witterings. Just too gorgeous for words ..
Let me tell you of this crafter’s arachnid of choice – it’s the golden orb spider. Why, I hear you ask, is it so special? Because, as this video shows, it’s silk has been harvested, spun, then woven into this most fabulous panel of jacquard weave fabric I’ve ever seen!! A shining, golden, gossamer wonder. Probably best viewed through sunglasses. Also check out this fine TED talk on the magnificence of spiders silks. It’s presented by a true arachnid fan, probably their biggest one, and the info. is incredible. BTW – you may have already come across these videos (both made a few years ago), but they are just so amazing I had to share! I love, love, love them. Egg cosys are one love, tea cosys are my other. My failed orangey experiment was to give me the knowledge to knit and felt a teapot that I could use for pouring alcoholic beverages. With no yarn to hand, this project remains on the back burner. 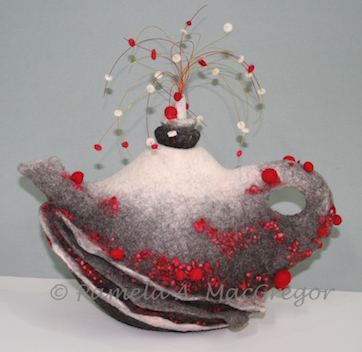 However these felting wizardesses – Pamela MacGregor, who uses wet felting to produce her stunning teapots and Stacy Polson needle felts her magnificent ones – obviously know their craft. So much talent, so little time to try and equal their marvellousness!! One day, oh yes, maybe I’ll get there… or not. Thx Jen!! Yes, was rather chuffed with myself … Now footy season is over you will no doubt start with festive season celebrations, leading onto new year celebrations, leading onto … easter etc. I do hope you’re well and happy Jen, and look forward to catching up when I return!! That spiders silk is truly amazing and magnificent. I watched the TED talk and enjoyed the info & enthusiasm v much. Also the mad teapots! I can’t wait to see if you can actually make a vessel of this type cath. 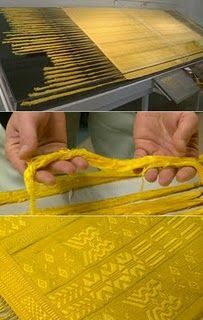 No wonder you’ve been experimenting with different types of yarns & needle sizes before felting up. Maybe you could feature in some way those Aussie wild flowers you’ve been showing us – would be beautiful. I’m just so impressed that you drove ralph to the hospital! – I know your anxiety musta been extreme coz you can’t bear to drive a vehicle (espesh one so MASSIVE) but you did it! I’m so proud of you lil Cath!! X! Thanks so much FG!! Yes, that spider stuff is really amazing – webbing stronger than Kevlar and totally biodegradable, amaaaazzzing. Need some for knitten!! I am a true caravan-en queen FG. The hosen and cabelen unhooken from car stuff – yep, aaah, just wot we vannen wimmen do. All done whilst wearen our safety footwear of choice, the haviana thong. Poor husband. I can relate to back problems. Back problems are indeed terrible to have and can be really debilitating – sorry to hear you have been a sufferer as well, hopefully you’re now pain free.